Seattle based chef Autumn Martin reigns supreme over the cities dessert scene. Her career started at the famed Canlis restaurant in Seattle, and she made her name in confectionery during her time at Theo Chocolate. Her side business Hot Cakes took off when she started selling Take ‘n Bake Molten Chocolate Cake in mason jars at local Farmer’s Markets. Only a few short years later she opened Hot Cakes Molten Chocolate Cakery serving the kind of desserts and cocktails every red blooded American craves. 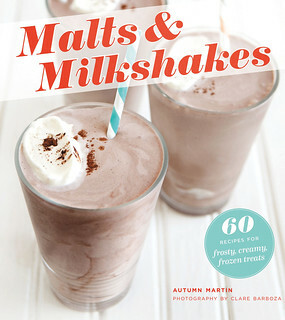 This month St. Martin’s Press is releasing her first cookbook Malt’s & Milkshakes, and they have provided us with a copy to give to one of you. To win the book, tell us in the comments what you like better, malts or milkshakes and why. The winner will be chosen at random. Milkshakes! More combos and well they just shake. Kurt, What is your favorite combination? I like milkshakes better. They have a creamier texture and are more widely available. I enjoy the richer flavor of malts over milkshakes, although both are an excellent treat during the summertime! malts cuz they are awesome!!!!! Malts! They’re thickness makes the treat seem extra delectable! Malts. When I was little, my father would make chocolate malts and sodas for us using a machine that he salvaged from a fountain in a pharmacy where he worked. Give me a handmade chocolate malt anytime to bring me back to those days FAST!